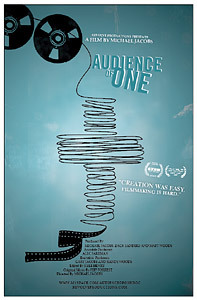 Audience of One (Director: Michael Jacobs): I’m finally reviewing this utterly unique documentary that screened at the Toronto After Dark Film Festival way back in October. I was lucky enough to speak to the director by phone tonight and though my recording is (at this point) almost unusable (crappy analog “phone taps”!! ), I’ll try to work in some of the stuff we talked about into the review proper. Richard Gazowsky is the pastor of the Voice of Pentecost church in San Francisco, and didn’t see his first movie until he was 40. But what an experience it must have been, for soon after he discovered the joys of cinema, he experienced a “divine call” to make the greatest biblical epic ever. Audience of One follows Gazowsky as he takes his congregation along on the almost inconceivable journey of making Gravity, a science fiction epic based on the biblical story of Joseph. Though he’s never directed a film before, Gazowsky confidently takes the reins, and forms WYSIWYG (“What You See Is What You Get”) Christian Film Works. Accustomed to dreaming big, he announces that Gravity will be shot in 70mm at 60 frames per second. Despite an all-volunteer cast and crew, the production soon decamps to Italy for some location shooting. Many problems ensue, from bad weather to mechanical problems to a general lack of preparation. Gazowsky presses on, confident that God wants him to complete the film. Michael Jacobs’ camera captures the drama over a period of 18 months, from the confident beginning through the trials of production and finally to what appears to be Gazowsky’s very public meltdown. Throughout, the pastor seems like an affable man, albeit a little obsessed with the idea of being a filmmaker. Mysteriously promised European funding fails to materialize, the bills pile up and the erstwhile director becomes more and more paranoid, suspecting the major studios of trying to steal his script. The whole enterprise spins further out of control and by the film’s end, it appears that Richard Gazowsky has painted himself into a corner. His obsession is compounded by his faith that God wants him to devote his life to making this film. Though it doesn’t shy away from the religious aspects of Gazowsky’s “quest,” this is really a universal character study. We see the pastor’s mother, a preacher herself who founded the church, haunting the proceedings with a sad look on her face. “I never should have turned the church over to him,” she laments. Gazowsky is a familiar character, reminding me of Klaus Kinski’s indelible Fitzcarraldo and Harrison Ford’s Allie Fox (from The Mosquito Coast). But in this case, Gazowsky’s pride is unassailable since he claims to be doing God’s work. But it also means he can never admit he was wrong. Jacobs told me that Gazowsky has supported the film and even participated in some Q&A sessions after screenings. But instead of administering a much-needed wake-up call, it seems to have re-energized him to continue raising funds to complete the film. Despite the immense amount of time and money spent already, only two scenes have been completed, and although they weren’t shown in the film, Jacobs promises to include them on the DVD release. It seems ironic that, despite the title of his film being Gravity, nothing seems to be able to bring Richard Gazowsky back down to earth. This entry was posted in After Dark, Documentaries, Film Festivals and tagged After Dark, christianity, Documentaries, religion, scifi. Bookmark the permalink. I like the comparison to Kinski’s character in “Fitzcarraldo”. Not quite as outwardly INSANE, but many similarities. I find it quite astonishing that the film and the Q&A’s have actually heightened his resolve…I actually kinda hope he gets the damn thing made. That’s cool that those scenes will be on the DVD. It screams out for a commentary track as well.